Cattone explores many mediums and is on a journey of self exploration. Her most recent works involve ink, oil and acrylics on steel and aluminum . The results are both spontaneous and controlled in a multi layered approach and textural finish. These have been well received and offer a new look for wine art. Her works have appeared on the cover of "Vine Times" magazine. Joey Cattone has been featured in Style Magazine , and was voted #1 Favorite Artist for two years running. She has also been featured in the Folsom Connect. Her painting "Serenity" was purchased by Marshall Medical Center for their new wing. Currently represented by Narrow Gate Winery in Pleasant Valley (a short drive from Placerville and the start of the wine tasting circuit south of Hwy 50 in El Dorado County) She is also the featured artist at Binz Winery in Amador City as well as Sutter Street Wine Works and Gallery in old town Folsom. A passionate community supporter of the arts, Joey volunteers for and supports the efforts of the El Dorado Arts Council. 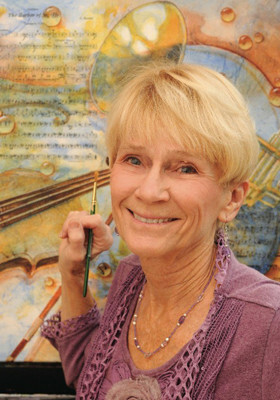 She is a member of the El Dorado Hills Arts Association and Tahoe Art League. Her works grace homes and businesses from the East to West coast of the U.S. as well as Canada.